WL-140, designed with 6-dBi indoor omni directional High Gain Antenna , which provides more coverage than standard PC Cards The Range Extender comes standard with a 1.8-meter USB cable, which gives you more flexibility in where you choose to mount your antenna. 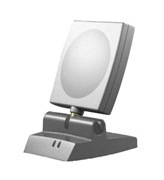 Furthermore, the WL-140 can be mounted on wall or ceiling and includes a wall mounting kit. It is fully compatible with other 802.11 b products and all ASUS space-link product.